ADLIB information systems have brought to the UK marketplace a free fully functioning, Spectrum-compliant, database package aimed at museums and private collectors. Adlib Museum Lite is based on 'its bigger cousin' Adlib Museum, used by museums worldwide, ranging from Heritage Centres to National Museums. The download file is not small at 100mb and took 10 minutes to download in the middle of the day with a broadband connection. Once downloaded the install wizard is simple to follow and takes no time at all, including an option to install demo data. An online manual in the form of a .pdf file is also installed. The screen layout resembles many other database packages. A menu bar at the top of the screen has large colourful buttons and a series of pull-down menus (Fig. 1). The software is based on five linked databases: Objects, Documentation, Visual Documentation, Persons and Institutions, Thesaurus and Currencies. 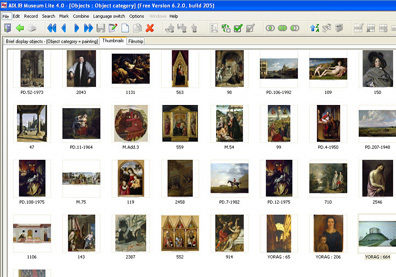 The objects database is the central dataset for the software. The others, mainly, provide reference datasets, created by the user, and used in the records in the objects database. The data recorded in each record in the 'Objects' database is split over seven screens: Identification/Production, Physical Characteristics/Condition, Documentation, Reproductions, Acquisition/Value/Location, Number/Notes and Management Details. Moving between the fields in each screen using the TAB key makes data entry easy and relatively speedy. Navigating between the screens is, likewise, simply done by clicking on the appropriately labelled tab. Overall, however, there are some issues that make Adlib Museum Lite imperfect. Spreading the 56 fields over seven screens ensures that each screen includes a lot of empty space. Perhaps consolidating some of these screens to include, for instance, 'material' to be alongside object identification and production fields on the first screen would make sense. Also the 'description' field on this first screen seems to be duplicated by another, but unlinked, 'Physical Description' field on the next screen. 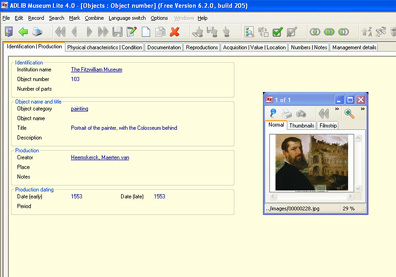 Images are displayed in a window floating over the first screen. Yet this window disappears when changing screen, so there is little sense in having this second 'Physical Description' on a screen without an image. The biggest surprise is the lack of any fields for recording field collection data. This, to me as an archaeological curator, makes the software pretty much useless, as it probably would be for any collections where context and provenance are important. 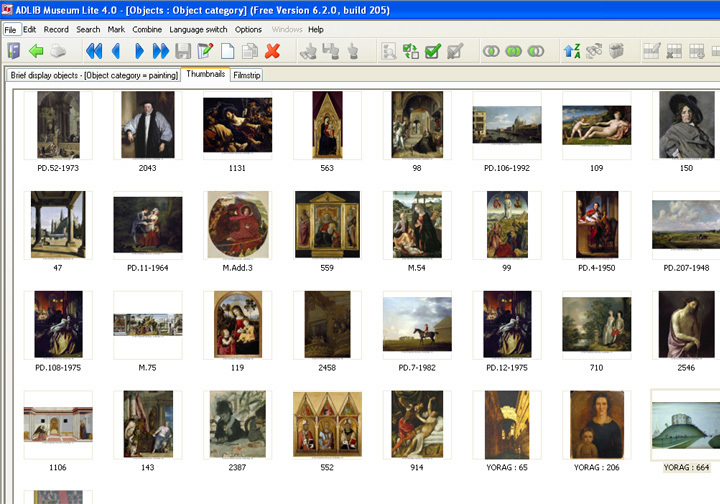 Of the 184 supplied demo records, the vast majority consist of paintings and photographic images and negatives. This perhaps suggests that the software developers are aiming the software at these particular collection areas. All five databases follow the same 4-step search wizard: select database, select access point (a field within a database), enter search criteria and display results. Each field in each database is searchable, producing a powerful search tool. My first search with a blank entry in the object number field returned (according to its own report) 184 records in 0.04 seconds yet the object numbers listed totalled only 100 records. The missing 84 records magically appear by pressing the down arrow key or selecting the grid display, although this is not specified (Fig. 2). Overall, Museum Lite does not seem to be a database appropriate for archaeology collections and it shares some of the peculiarities of its 'bigger cousin' that, as a user, tend not to fill me with confidence. Those wishing to include field collection data (essential for most archaeological objects) as part of their documentation will have to choose the full version of Adlib Museum. Adlib Museum Lite will not be sufficient for most projects. Bert Degenhart Drenth, General Manager, Adlib Information Systems. Sent Mon, 3 Jul 2006. Fields have quite deliberately been thinly spread over the display tabs of the system, so this allows plenty of room for repeated occurrences of them to be displayed on screen. This is a key feature of the way the system works. The floating image window can in fact be 'pinned' in place by clicking on the 'map pin' icon, which means that it will then continue to remain visible on all screen tabs. Finally, as the reviewer points out, when dealing with archaeological collections the recording of field collection information is essential. As Museum Lite was originally devised as a general purpose object recording system, tough decisions had to be taken about what recording aspects should or should not be included. However, we acknowledge that the lack of a 'field collection' recording screen tab does impair the software's usefulness to the archaeological community, and so we have decided to revise the application to now include this functionality. This new release of Adlib Museum Lite will made freely available on our website http://www.adlibsoft.com from August 2006.